The Fulton Medicine Place, 360 W. First St., celebrates 25 years of serving the Greater Fulton community this November, said Frank Badagnani, owner. During November, Fulton Medicine Place will be offering free “Brown Bag” medications reviews for customers. “This 15-minute session (a $25 value) is a one-on-one discussion between pharmacists and customers which ensures that their questions are answered, avoids medication errors and drug interactions, and assists them with taking their medications correctly,” Badagnani said. “We’re offering this service to thank our community for their support over the past 25 years. The Fulton Medicine Place, 360 W. First St. celebrates 25 years of serving the Greater Fulton community this November, said Frank Badagnani, owner. During November, Fulton Medicine Place will be offering free “Brown Bag” medications review for customers. “This 15-minute session (a $25 value) is a one-on-one discussion between pharmacists and customers which ensures that their questions are answered, avoids medication errors and drug interactions, and assists them with taking their medications correctly,” Badagnani said. “We’re offering this service to thank our community for their support over the past 25 years. 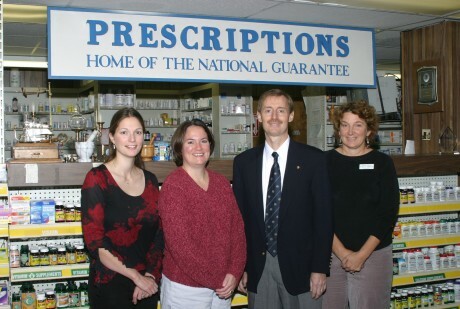 Pharmacists include (from left): Erin Hess, Tracy Dingman, and owners Frank and Fran Badagnani. “Zachary Merry, an Albany College of Pharmacy Doctor of Pharmacy student, and Michelle Handzel, a University of Buffalo School of Pharmacy Doctor of Pharmacy student, will conduct the reviews with our customers. Badagnani said that he and his wife and co-owner, Fran, have put down roots in Fulton since they moved here and opened their original 200 E. Broadway location in 1987. As a result of sustained growth, they relocated to their present W. First St. location, which is three times the size of the E. Broadway spot. “During the past quarter century, we’ve grown from a corner drugstore to a larger location” Badagnani said. “Competitors have come and gone, but we’ve been fortunate to get to know so many of our friends and neighbors who have, in-turn, become loyal customers. “In Dec. 2006, we opened a 1,900 sq. ft., 464 Main St., Phoenix location managed by pharmacist David Dingman. Dave purchased the Phoenix Medicine Place in 2011 where he is also seeing steady growth. Badagnani said that a lot has changed in the business since he started: “Twenty five years ago, the average cost for a prescription was about $10 and people paid out of pocket. Today, the average cost is about $80 for a brand medication and a third party pays for about 90% of prescriptions. We’ve become experts at working with insurance companies, Medicare and Medicaid to help our customers with coverage. “Overall, however, prescription costs have gone down because of the large number of generic brands that are now available. Badagnani said both Fulton and Phoenix pharmacies provide total healthcare packages with knowledgeable pharmacists, quality products, and personalized services. In addition, they fill Workers Compensation prescriptions and accept most insurance coverage plans. They maintain personal medication profiles, and will offer wellness programs such as health care screenings, and carry a variety of Leader Brand non-prescription products, which offer all the quality of national brands for up to 50 percent less. The Medicine Place is part of the Leader Network of more than 3,000 independent pharmacies. “This gives us the buying power of a chain while maintaining the personalized service of an independent store. We guarantee our customers quality, service, professionalism, and value,” said Badagnani. We look forward to many more years of service to both the Phoenix and Fulton communities. For further information, or to schedule a Brown Bag medicine review, contact Fulton Medicine Place at 593-8378.